Move over “tasting your way around Epcot’s World Showcase”! Animal Kingdom theme park is stepping up their game in not only the addition of nightly entertainment and Pandora – The World of Avatar, but their food and beverages are something to be sought after. If you’re like us and enjoy sampling a variety of cuisines, this list is especially for you! 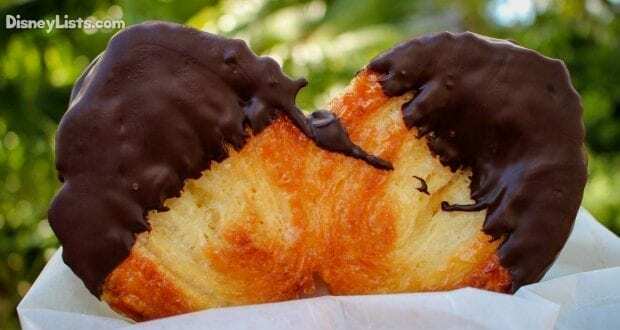 Travel with us around the lands of Animal Kingdom and be prepared to inspire your taste-buds with these top 10 best snacks at Walt Disney World’s Animal Kingdom. Avatar Flight of Passage is probably our new favorite attraction on Walt Disney World property. It takes a few minutes for us to get grounded however after the ride… plus we all want to talk about the experience as soon as we get off. Well, take a moment to stop for a Pandorian-inspired snack at the Pongu Pongu window just steps outside of the Windtraders shop (aka the exit of Avatar Flight of Passage). 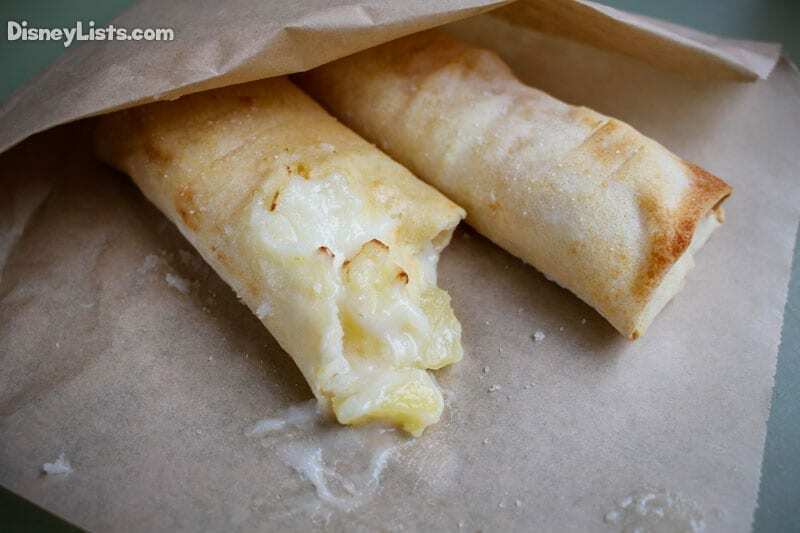 Our favorite snack here is the Pongu Lumpia which is a pineapple cream cheese spring roll. It’s a simple snack that holds a burst of fresh pineapple in every bite. It’s an easy on the go snack and partners well with Pongu Pongu’s unique specialty beverages. If you aren’t a pineapple fan, check out Pongo’s Viper Claw or the Colossal Pretzel! It’s super easy to walk right on by Kusafiri and never notice it – especially when the focus is getting to Kilimanjaro Safaris in Africa. Kusafiri looks like a little hole in the wall style corner shop with a simple window to order out of. Don’t let the exterior fool you however, as this shop has an awesome menu of small entrees, snacks, and beverages. Our go to at Kusafiri however is the huge Elephant Ear Pastry. This sugary, puff pastry is not only filling in size but has just the right amount of sugar goodness without going over the top! Our favorite part is the chocolate dipped tips of the “ears”. If Kusafiri has too long of a line but you’re still looking for that Elephant Ear fix, head over to Isle of Java in Discovery Island for one! Make a right turn in front of the Tree of Life and chances are you’ll start smelling the amazing aroma of smokehouse barbecue seeping its way out of infamous Flame Tree Barbecue in Discovery Island at Animal Kingdom. While we typically recommend Flame Tree for an ideal sit down, meal option – we have a favorite snack we like to pick up here. The Onion Ring Basket is that perfect snack to share, or go ahead and be selfish and keep it to yourself! Dip these babies in ketchup and enjoy. A common misconception is that the famous Dole Whip can only be found at Magic Kingdom. We are happy to report this is not the case at all, and we actually like the different versions of Dole Whips at other locations almost more than the Magic Kingdom version! Tamu Tamu Refreshments is a perfect example of a Pineapple Dole Whip we can get behind. Head over to Africa to enjoy the original Pineapple Dole Whip or make it an “adult” version! You can get two kinds of alcoholic Pineapple Dole Whips including Dark Rum or Coconut Rum Dole Whips! If you’re looking for something besides a liquid snack at Tamu Tamu, we highly recommend their Chocolate Waffles with vanilla ice cream or chocolate mousse. You can have your Whip and eat Waffles too! Sometimes you want just a little heat to your snack! Swing by DinoLand U.S.A. to visit a little kiosk called Trilo-Bites. It doesn’t look like anything impressive but this kiosk is easily one of our favorites for snacks at Animal Kingdom. The zesty Buffalo Chicken Chips are where the heat is at! House made chips are topped with Buffalo Chicken and a fresh veggies like celery and diced tomatoes. While we aren’t huge bleu cheese fans, the bleu cheese dressing balances the heat with a fresh taste. Partner this with #9 mentioned below and, well, sheer taste-bud bliss! Not a chips person but want that Buffalo kick? Check out the Buffalo Chicken wings at Terra Treats in Discovery Island. A bit on the pricey side for a snack… close to $15, the Turkey Leg is a staple in Walt Disney World snacks. While it seems like the Turkey Leg is available in fewer and fewer locations, you can still get a delicious Turkey Leg from Yak and Yeti Quality Beverages in Asia. This is an especially hard window to spot as it is behind/on the side of Yak and Yeti Local Café. Yak and Yeti Quality Beverages is known as being a lounge, but still produces a delicious Turkey Leg! Looking for a quick snack that you can one-hand and enjoy on the go? 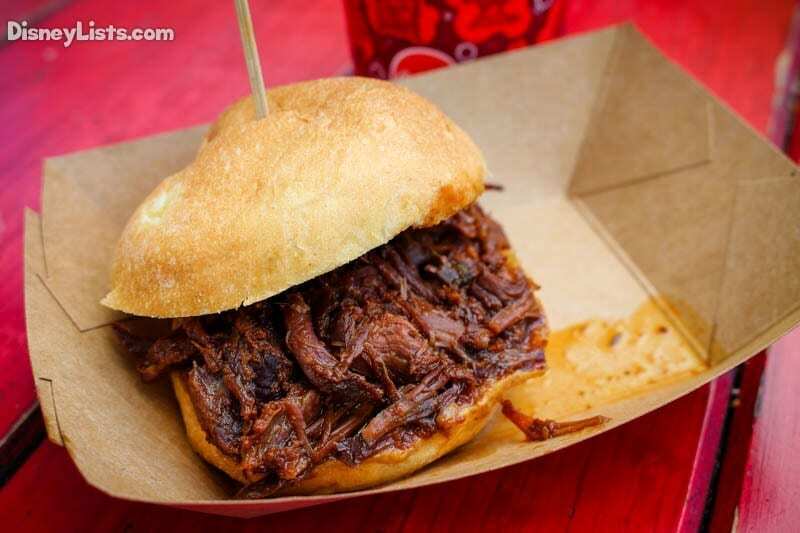 Drop by the Caravan Road kiosk in Asia to enjoy their Teriyaki Beef Slider. It’s partnered with a pickled cucumber for crisp bite that blends wonderfully with the juicy Teriyaki Beef. The only complaint here is that you’ll want more when you finish your slider! If you haven’t tried the Cinnamon-Glazed Pecans or Almonds from Drinkwallah, you really should add this to your Disney bucket list! It seems like the most simple snack… nothing special, right? But, YUM – this snack is memorable. A great taste, easy sharing, and goes great with the variety of beverages available at the multiple Animal Kingdom lounges. A great second location to pick up the Cinnamon-Glazed Pecans or Almonds would be at the Mahindi kiosk in Africa. @ Trilo-Bites in DinoLand U.S.A. Yes! We’re back at Trilo-Bites which we mentioned with the Buffalo Chicken Chips in #5 above. Partnering great with the Buffalo Chicken Chips or as a standalone awesome snack, is the Smokey Bones Chocolate Shake. We’ve all had chocolate shakes, right? This one includes Bourbon and Candied Bacon. The Bourbon is wonderful enough, but CANDIED BACON! Who doesn’t love chocolate, bourbon, and bacon! It’s truly a sip and nibble of deliciousness! Eight Spoons… you’ll need only one to enjoy this Baked Macaroni and Cheese! Eight Spoon Café in Discovery Island is a great place to taste a filling snack that makes for a perfect way to get your fill on the move, in snack form. Take your snacking one step further and get the Baked Macaroni and Cheese with Pulled Pork or the Baked Macaroni and Cheese with Shrimp and Sweet Chili Sauce. Cheesy goodness awaits at Eight Spoon Café! As you can see, we are passionate about our Animal Kingdom snacks. What’s your most memorable Animal Kingdom snack? We’d love to hear from you!